THE night after Dr Marcelo Kanczuk worked on one of the Cid Harbour shark attack victims, he was plagued by bad dreams about the razor-toothed ocean predators. "A few of us had nightmares of being attacked by a shark," he said. "We had some distress. That's the reason why we do a debriefing, so we could say what everyone felt and if we needed extra support. It was a very stressful situation." Anaesthetist Dr Kanczuk did not want to say which of the three shark attack victims he worked on in order to preserve the patient's privacy. "I think it was about 20 minutes from when the patient arrived in hospital to when they were prepared and ready for surgery," he said. "It's interesting how we can get very stressed before the experience - everyone is very anxious about what we are going to see, because we don't have a lot of information about the patient. But when they arrive everyone works so calmly and we work so well together." 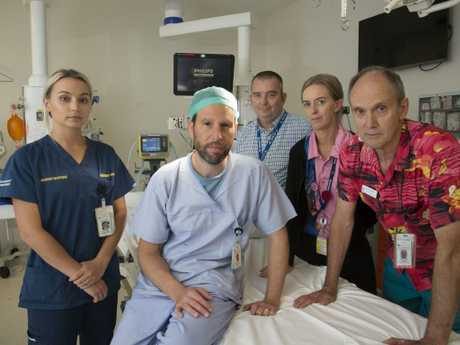 Dr Kanczuk has worked in 10 hospitals all over the world and said the treatment all three patients received at Mackay Base Hospital was second to none. "It was amazing … for the two who did survive, that may not have been the case in 95 per cent of hospitals around the world," he said. Hospital intensive care unit head Dr Stuart Baker has worked in Western Australia, so these weren't his first experiences with shark victims. The ICU team was tasked with monitoring blood loss. 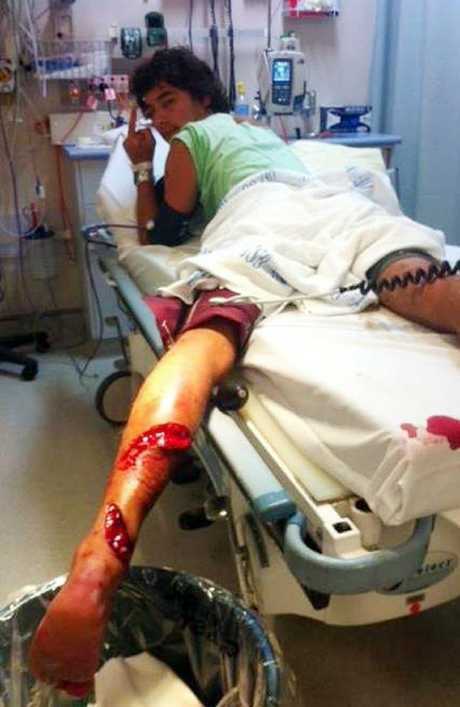 2012 shark attack victim Billy O'Leary shows off his bite wound at the Gold Coast Hospital, Southport. 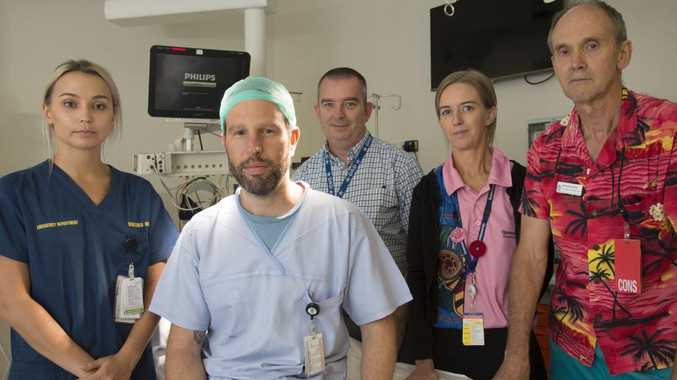 "These three patients all lost a lot of blood before they even got to hospital, and part of what happens when you lose a lot of blood is it limits your ability to clot, so if you lose a lot of blood you continue to lose more and more blood," he said. "Losing a lot of blood predisposes people to being very sick and having a prolonged stay in hospital, so if we can minimise the amount of blood lost we can help keep them alive and keep them alive in a better state that they would otherwise be." He said one of the most challenging aspects of dealing with a complex trauma case was managing the patients' families. This is where social worker Tracey Good comes in. She was the duty social worker for all three cases. "Making sure (the family) have somewhere to stay, or have something to eat, they're things that seem simple but when a trauma happens can be very difficult to manage," she said. Emergency department senior medical officer Dr Andrew Giles said all three victims were major bleeding traumas and put in the highest classification of "red trauma". Emergency nurse Amy Takagaki said communication between the teams treating the victims was challenging. "It was the first time, for a lot of people, coming into contact with a trauma like that, but the hospital has been very supportive of all of us," she said. 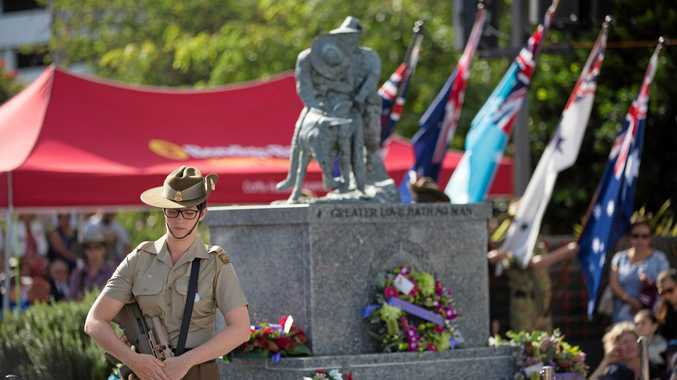 "After anything of this significance it's kind of difficult … but you can always rely on your co-workers for support and … have a chat with them."